TORONTO – Paging William Nylander. The National Hockey League’s most potent offence has suddenly, shockingly run dry. After cruising through the season’s opening fortnight at a breakneck five-goals-a-night pace, the Toronto Maple Leafs have managed to find the net just once in back-to-back home losses to big, smart, veteran playoff clubs. For a tedious stretch of 116 minutes and 37 seconds, the talent-loaded Leafs came up empty, and the home side’s inability to take advantage of this fall’s very average-looking Jake Allen led to a controlled 4-1 road victory for the St. Louis Blues in Tyler Bozak’s homecoming affair. Bozak, an undrafted NCAA discovery who gave Toronto the first 594 games of his career, enjoyed dinner and jokes with his former mates Friday night and made his emotional on-ice return Saturday, his wife, two young sons and parents in tow. “Bozak was good player for us. 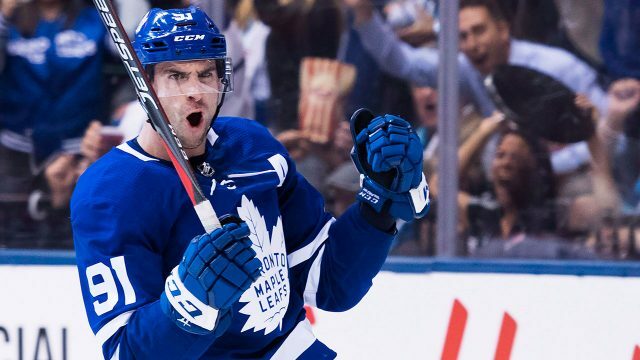 He was good on the power play, he was smart, good in the faceoff circle, helped our team have success and get to where we are now,” Leafs coach Mike Babcock said. But Bozie’s Blues didn’t need luck. Instead they summoned effort, structure and execution to dish the new-look Leafs their third loss, all at home. During the contest’s first TV timeout, Bozak glanced up from centre ice to see a 42-second video tribute to his nine seasons wearing No. 42 for the Blue and White. Bozak gave the applauding Scotiabank Arena a twirl and a salute. A deep exhale. With veteran Jay Bouwmeester healthy-scratched for the first time in his 16-year career — “I’m not going to talk about any of that s—,” he told reporters huddled around his stall after the morning skate — ironically it was his lineup replacement, stay-at-home D-man Robert Bortuzzo, who opened the scoring. Bortuzzo’s deflected point shot found a path through a cluster of bodies and bounded between Frederik Andersen’s legs early in the second period to give the Blues the jump. Toronto has now dug itself a hole by surrendering the first goal in seven of its nine outings, and on this evening appeared listless in doing so. That hole deepened when David Perron set up Zach Sanford in the slot and the winger dented the mesh with a wrister. St. Louis needed and wanted this one more, and it showed time and again. Despite a flurry of much-lauded off-season moves, the Blues rolled into town as the only Western Conference club without two wins to rub together, and they performed like the more prepared and more desperate group. The Leafs struggled with breakouts — an emerging theme — and seldom gathered the crisp speed necessary to bust through a clogged neutral zone. Here’s a telling stat: Toronto gave the puck away 21 times, St. Louis only nine. The Leafs’ top D pair of Morgan Rielly and Ron Hainsey alone combined for nine giveaways. “Once you play a couple games and you watch video on teams, you’re able to prepare a little better,” Rielly explained. “Maybe that’s on us to do a better job as players to prepare ourselves to be ready for the start of games. That’s what other teams are doing, so we gotta be ready. Before the second period wrapped, O’Reilly snapped his first as a Blue. Just like that, high-flying Toronto had given up six consecutive goals in its own building, while scattering a mere eight shots on net over 40 uninspired minutes. Silence on a Saturday night. Attending fans were forced to make a choice: bolt early and beat traffic or hang around and yawn. The more boring the style of play, the less chance the Maple Leafs have of winning. “We scored early [in the season]. We scored easy,” Babcock said. Peeling a page from Pittsburgh’s book, the Blues choked the neutral zone and pushed the Leafs to the perimeter, limiting the local heroes’ second-chance opportunities and offensive-zone time. The outworked, outsmarted Leafs need to own this one. Showing some late pushback, Rielly mercifully snapped the goal drought with a nice cut-and-fire into the slot in the third period, but no way the Blues were giving up four. They owned middle ice. It’s during a mini slump like this that you realize how top-heavy Toronto’s offence has been. Nazem Kadri scored 32 goals last season; like Jake Gardiner and Andreas Johnsson and Tyler Ennis, he’s still looking for his first this year. Patrick Marleau notched 27 last season; he has one this year, and it was on the power play. Connor Brown is a one-time 20-goal man; he’s scored once this year, and it was into an empty net. Nylander sniped 20 last season; he’s skating with some Austrian team you’ve never heard of. Diving into their first losing skid, and what should be their first hard look in mirror, Toronto will test its perfect road record in Winnipeg Wednesday. Grinding out quality scoring chances won’t get any easier there. “We know we’re going to have some tough games, some tough matchups. Teams are going to play well, they’re going to make adjustments, but we have to battle through that. We can’t get frustrated,” said John Tavares, the man who made Bozak expendable.